oh, sweet joy! : ((outfit schmoutfit)) brrrr + surprise blowfish giveaway! 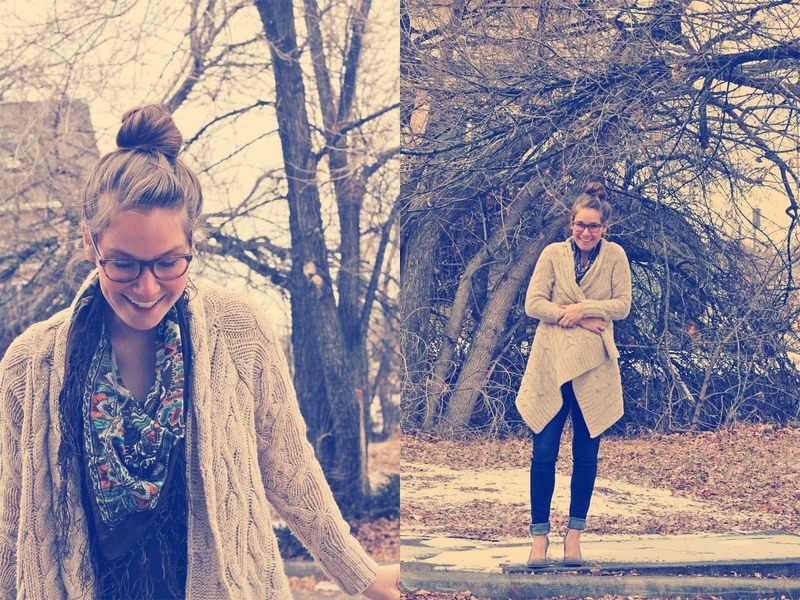 ((outfit schmoutfit)) brrrr + surprise blowfish giveaway! It has been absolutely FRIGID around here. We've had a few dustings of snow, but really, I'm over the single digit temperatures. What I'm NOT over is wearing comfy cozy sweaters styled with skinnies and wedges or heeled booties. Let's talk about how perfectly these Blowfish wedges anchor this outfit, no matter how casual it is. We can then talk about how comfortable these pretties are. But before we're finished here, let's also talk about the fact that you can enter to win your own pair of Blowfish shoes today!! Just enter on the following widget & cross your fingers! I'd go for the Goswynn or Colt flats. Love how these wedges look with your outfit though - perfect mix of structure/flow and fancy/casual. I'm in love with the Bree and the Topanga! I love allll their wedges! How do I pick just one?! I Like the Castana boots. i love your wedges!! super cute! and i'm really loving your maternity style. i'm a couple of months behind you and i'm loving the ideas. I love the illi wedges in the black! so fun. I love Blowfish shoes! I just bought my first pair of boots last month! I love your outfit! Especially that sweater--it looks super warm and comfy. :) As for Blowfish, I think the Queen flats are my fave, but there are so many cute pairs of shoes there! I love the tellund boots and illi wedges! I love the Kanne boots in black! But those brown tweed wedges are so cute! Love the outfit! The shoes are gorg! Cute! I love the wedges! I love the Trick booties. Too many Must Haves from Blowfish to choose just one- Thanks for the chance to win! I love the Illi in the Brown Cozumel Linen... But I also love so many others! Love the Illis in Brown Cozumel Linen... But also love so many others! I have loved Blowfish forever! Great comfy shoes. And those platform pumps you're wearing look super cute!! 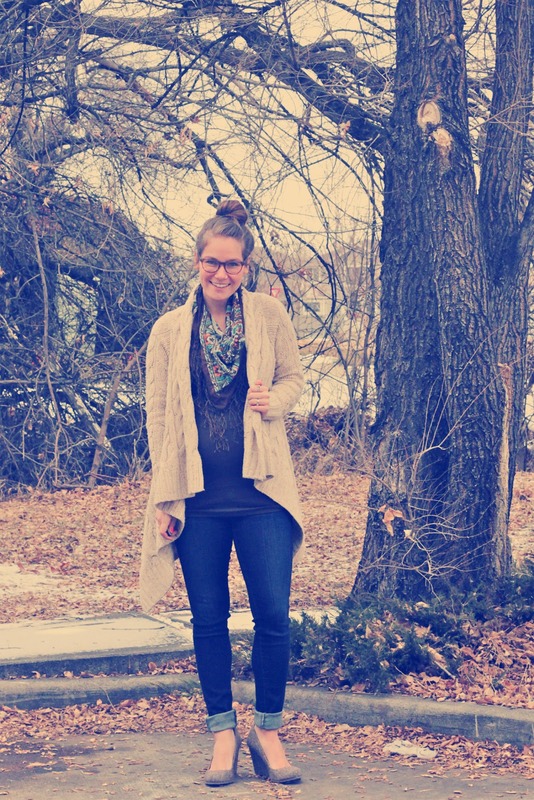 I love the Caden booties! So cute! The sweater looks SOO cozy! I am loving this whole outfit! I love the Travel oxfords! I love the Caden boots + the Illi wedges!! I like the ironik, because they are bit out of my comfort zone. There are so many cute shoes that it was hard to pick just one favorite! I love the Iris wedges! love these photos! the coloring is stunning! you're layered look is flawless! I like the Illi wedge, in Natural Cozumel linen, with the animal stripes! I really like the polka dot Priscilla ones and Rho. you are the cutest!! I love blow fish - my fav right now are the travel shoes in earth suede. beautiful! You're adorable. Always. LOVE that cozy sweater. My favorites are the Renettas! So cute. It would be great to win some shoes. Look at you still rocking wedges in your 3rd trimester! I love Blowfish Boots. What a great deal! Rudder, Fillmore, Ridley--I can't decide which is my most favorite! I love the Caden boots in Black and Rust Cheetah!! The India booties are my favorites! I would love to win the Gabby in black! I need to get out of my comfort zone & get some booties! Would love the Bendy!!! Thanks for the opportunity! I love the Kaydon boots! Oh man I want these!! you are so stinking adorable!! love the filter on these photos. my fave pair is the Illi in brown tweed. would love a pair of wedges! I love love love Bendy in Brown! I own several Blowfish Shoes and they are one of my favorite brands! So cute but oh so comfortable! The Tugo is SO cute! Love the Illi wedges in Black Tweed. I like the BREE shoes. I SOOO LOVE the India!!!!!!! I adore the Ironik boots! What a great giveaway! Love those wedges! I also really love your glasses and that scarf. love the Himalayan!! ahh i love all blowfish shoes! I love either the Romiro boots or the Makepeace boots! I LOVE the Razmitten in Earth Faux Suede With Natural Shearling !!! I love the Kipper booties! I love the Neo and Prestige flats! Having a hard time choosing between the Rebel, Reflect, and and Nadki! All too cute! you are precious! 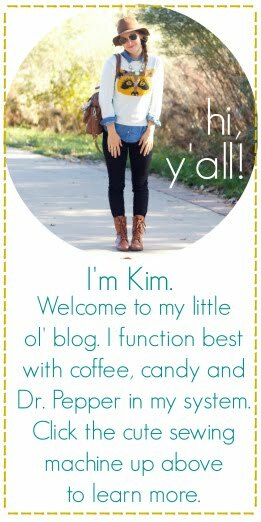 i so have loved stumbling across your blog, as a fellow texan! I love your outfit! I agree with you: those wedges are the perfect outfit anchor! I pinned your pepper recipe, looks delicious! 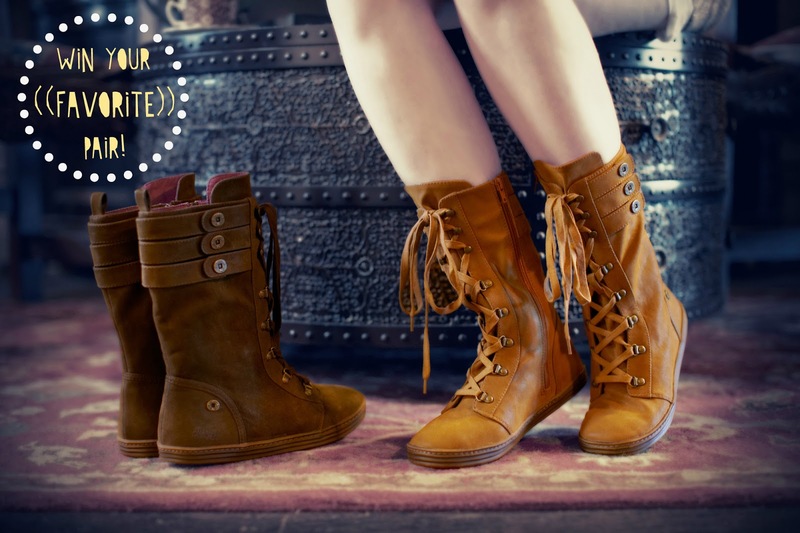 Those lace up boots are adorable and perfect for winter! It's a toss up between the Illi wedge and the Ridley boot. Both so adorable. I pinned this outfit and giveaway! I am loving the "trick" booties - so cute! The Ridley is my favorite. I love the Gypsy shoes. I like the Rho flats in the wine color. I love the Bree wedges. Black Page. I got married in a great pair of blowfish shoes! My favorite pair is the Kanne boot in Whiskey! i like the kanne or the renegade boots (in brown) best of all! I love the tweed Illi wedges that you are wearing in your pictures! I love the illi shoes, not sure which color I would choose though. Love the whole outfit! Super cute! I love the Romiro boots in earth. In love with Tugo and Caden!!!!!!! <3 and love that outfit! I'm currently in love with Inspiration and Illi. I love the Mistress boot! I pinned the Southwestern Stuffed Bell Peppers. They look delightful! Can't decide between the Cornish and the Quick! i love the tugo booties with the hidden wedge!!! too cute!! My favorite pair would be Tugo or Vamp! The Nice flats look great! I LOVE those boots. Perfect for winter! Brrr! Love Blowfish shoes. I could use some for the winter weather we're having here in Chicago too! I love the razmitten boots in black with the herrigbone trim. I've been dying for a pair of India's!! I love the Razmitten and the Romiro shoes! Thanks for the great giveaway and fingers crossed that I win! I really like the Rammish booties. Oh I love those tweed wedges, I've never seen them before! I also really love the India booties. I like the India in black! I've wanted something like the tan India's all winter! I like the Nelda flats! I love all the boots, it would be hard to chose! THe Iris in Taupe are so cute! Oh wow! I love the Tom Boy pair! I love the Nelda shoes. Super cute! Thanks for the awesome giveaway! I had more than one favourite, but I tried to pick one that would be a bit more dramatic than what I normally choose. I chose Topanga. I like Rudder in black. I love the Illi wedges! i really want to try the illy wedges!! love them! Nelda in dark brown suede! I have a matching brown velvet headband and hairbow to go with these cute flats! I've been needing a new pair of boots for a while... I love the "Today" and the "Kick Back" boots! I love "Chelsea"! I love cute shoes I can still teach in! The llli' sare supper cute! One of my favorite pairs of shoes are by Blowfish--I love them all!!! :)My favorite would have to be the "Rabbit" bootie, though. I'm really digging the Bendy boots!